Locally Convex Properties of the Space of Continuous Functions Endowed with the Compact-Open Topology. Barrelledness Conditions on Topological Tensor Products. Holomorphically Significant Properties of Locally Convex Spaces. A Short Collection of Open Problems. A Table of Barrelled Spaces. References. Index. This book is a systematic treatment of barrelled spaces, and of structures in which barrelledness conditions are significant. It is a fairly self-contained study of the structural theory of those spaces, concentrating on the basic phenomena in the theory, and presenting a variety of functional-analytic techniques. Beginning with some basic and important results in different branches of Analysis, the volume deals with Baire spaces, presents a variety of techniques, and gives the necessary definitions, exploring conditions on discs to ensure that they are absorbed by the barrels of the space. 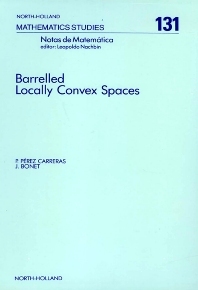 The abstract theory of barrelled spaces is then presented, as well as local completeness and its applications to the inheritance of the Mackey topology to subspaces. Further discussed is the abstract study of bornological and ultrabornological spaces; B- and Br-completeness; inductive limits; strong barrelledness conditions; characterizations of barrelled, bornological and (DF)-spaces in the context of spaces of type C(X); the stability of barrelledness conditions of topological tensor products and the related questions of commutability of inductive limits and tensor products; and the holomorphically significant properties of locally convex spaces as developed by Nachbin and others.